Jacks or Better Progressive is a popular video poker game featuring progressive jackpot as the highest payout. This exciting game provides players with a chance to win large progressive jackpot with bets from £2.5 per hand, while your max bet can be as high as £125. You can play from 1 up to 50 hands at a time. To begin, chose your coin size and select how many hands you want to play. You can play a single hand, 5, 10, 25 or 50 hands and each hand costs you your selected coin size. But remember, the fewer hands you pick the higher the maximum coin size gets so make sure you get the balance right! The Jackpot can be won by getting a Spade Royal Flush, so it's certainly worth holding cards that make this hand a possiblity. 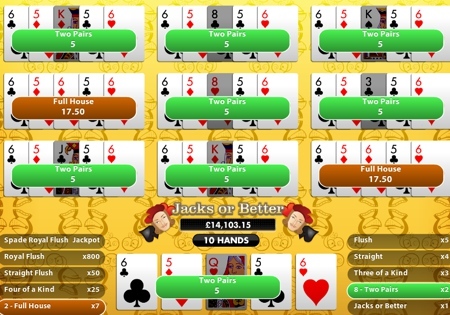 The largest progressive jackpot that was hit on the Jacks or Better Progressive video poker is £29,478. Check out Jacks or Better and other Video Poker jackpot winner stories and testimonials.